Adams and his brother, Zach, released Dwarf Fortress in 2006 after four years of development. It’s an expansive, intoxicating game, where you corral a party of dwarves and create an underground colony for them, protecting them from various dangers along the way. Its ASCII-art world is meticulously detailed, creating wild scenarios where you freak out over a cluster of lowercase, grey letter “e”s on a screen because it represents an approaching elephant herd. Over the years, as Dwarf Fortress has gained a cult following and even been shown in the Museum of Modern Art in New York City, the Adams brothers have been able to support themselves through one-time donations from fans, as well as through their Patreon, where they make over $US6,000 ($8,462) a month. But as Adams gets older, the cost of living has gone up. It hasn’t escaped Adams’s notice that similar games on Steam do extraordinarily well, like Prison Architect, Rimworld, and Gnomoria. “Sales there over many years are in the, what, million or so range? That’s still unfathomable to me - not because those games didn’t earn it, but just the number. That’s a big number, beyond the sort of metrics we see personally,” he wrote. Given those numbers, Adams said that putting the game on Steam was a no-brainer. If it succeeded, it could potentially match the sales of those other games. If not? Sure, he’s back at square one, but he’s still in a position he says is survivable. 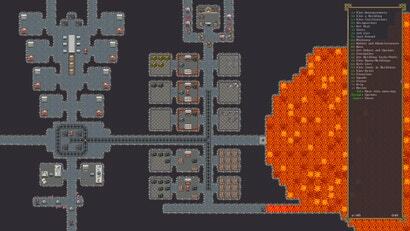 Adams has been continually updating Dwarf Fortress ever since its release, and said that he doesn’t think Dwarf Fortress will ever reach a state where the game feels finished to him. “Oh, no, never,” he said. “I’m sure some games feel finished, maybe? But I’ve never written one that feels that way.” he said. “If you conceive of your game a certain way, that there’s a path you’ve taken through the possible features, and you’ve polished and pared it down, and made good decisions, then perhaps it feels something like finished when you’ve realised your list. But, hmm, these are not skills I’ve been practising broadly, though we do try to make each release feel somewhat contained to a few themes that work well with everything that’s already implemented,” he said. It’s been nearly two decades since Dwarf Fortress began development, and it’s possible that it will be in development for as long as Adams is able to keep it up. Putting the game on Steam is one path to sustainability for Tarn and Zach Adams. At least, it might keep their co-pays down. I've really enjoyed this game, and on a level most other games can't quite touch. The narratives the game evolves on its own are incredible. Best wishes to the Adams family, thanks for gifting us dwarf fortress for free or donation for so long. I'll be picking up a copy on steam. Well, that's what happens when you live in a third world country like ameridumb. It's sad, and it shouldn't have to happen, they're just so far behind other developed nations.